Not for the gluten intolerant. Now, All you got to do is add a cup of flour and add it to the mix. We'll be cooking by the book, for now it's time for cake! And other baked goods. 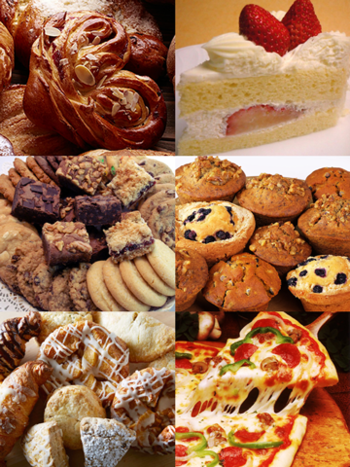 These are all about tropes about the bakery, the cakes, the pies, the cookies, the cupcakes, the pastries, the pizza, and the other baked goods, and baking in general. Best with coffee or tea for cakes and pastries, and beer for pizza. A subcategory of Food Tropes. Also see Fruit and Vegetable Tropes, Meat of the Index, and Sweet Treats Index. Not to be confused with This Is Your Index on Drugs. This isn't that kind of baked. The French know how to leave you into a world of pain. A wedding cake is just tad boring without a miniature version of the newlyweds. Carrying a giant cake should be easy as pie, right? After a good fight, have a freshly baked Hostess™ Fruit Pie and have a good laugh. Cops love the smell of freshly baked donuts in the morning. They always deflate, or explode, at even the slightest of movements. The one you often see at Christmas. "I'd like to order a Margherita, please. Oh, but no pineapple." Too much of yeast is just overkill. You'd hope they're not kidding. Top it with a nail file, and the guards won't still notice. "Like pie, life hits you in the face." Watch out! It's cherry filled! They come in handy when you're Late for School. You put it in your mouth and you run before the bell rings.